Paul Porto is a twenty year veteran of the retail visual merchandising industry. 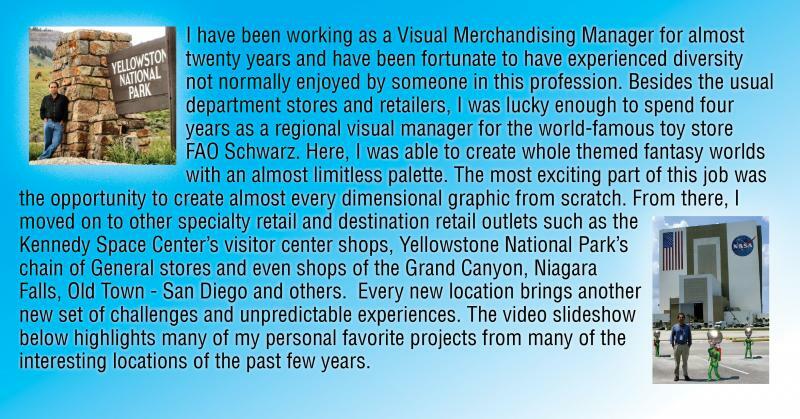 He has worked in visual management for such varied clients and employers as FAO Schwarz, Macy*s and Gayfers department stores and even some less traditional retailers as the Kennedy Space Center visitor complex and Yellowstone Park's chain of General stores. Over the years, themed retail has become a specialty and the production of custom graphics and props integrated with merchandising has become a focus. Copyright 2009 Paul Porto Port-o-folio. All rights reserved.